Anybody who reads the health news knows that in the past several years we have seen a huge jump in the number of cases of pertussis (whooping cough). In fact, we are experiencing the largest outbreak of this infection in fifty years. This graph shows the incidence rates; disease incidence is usually expressed as the number of new cases per 100,000 population. What is the cause of this ? The largest contributor is a decline in vaccination rates, but there are other things about pertussis, and its vaccine, that are important to know if you want to understand how the disease behaves in populations. The pertussis vaccine is combined with other vaccines — diphtheria and tetanus — in a single shot, called DTaP. Each capital letter stands for one of the three vaccines in the shot; the little “a” indicates that the pertussis vaccine component is “acellular,” to distinguish it from the older version (the DPT) made from whole pertussis bacteria. That version caused more reactions (mainly high fever) in children who received it than does our current, acellular variety. A child should receive the DTaP at 2, 4, 6, and 18 months, and again at 4-6 years of age. One concern among vaccine experts is that the newer DTaP vaccine, although associated with fewer side effects, also appears to be less effective in generating a protective immune response. 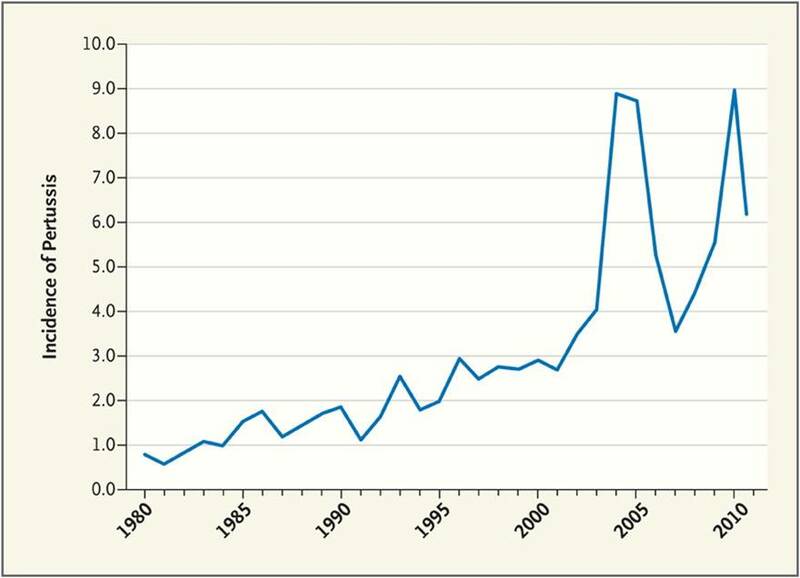 Overall, pertussis vaccine has been a success, with the number of annual cases, and death rates, dropping enormously. The incidence rate in the 1940s was 157 per 100,000 population; by 1973 this had dropped to less than 1 per 100,000. (You can read about the development of the vaccine here.) As you can see from the graph, we are still far, far below the rates of the prevaccine era. The persons most vulnerable to getting severe or fatal pertussis are infants, often before they can even get their first vaccine shot. So the only way to protect them is for everyone else to be vaccinated so as to be unable to bring the infection to them. Our current vaccine works in older children. And we now have a pertussis booster shot that restores immunity in adolescents and adults. It is called Tdap, and I strongly encourage every adult to get this, especially if you are exposed to young children. Pertussis vaccine is unusual in this way. All vaccine strategies for protecting populations involve what is called herd immunity, but the principle for controlling pertussis is primarily based upon keeping vaccinated those for whom the disease is only mild, so that they may be prevented from passing the infection to infants who are too young to join the vaccinated herd. We do it for the common good. You can find an enormous amount of useful and reliable information here, at the Vaccination Education Center maintained by the Children’s Hospital of Philadelphia.